As a development: Developing a trip or making real a career, or creating a movement. As an adult woman: They light up a room when they enter, radiating warmth and energy, humor and spirit. Very often this queen is in entertainment, an actress or pop star. The Queen of Wands can also be a leader and activist. Like other Wands, the Queen of Wands signals having charisma, drawing others to you like moths to a flame. Her energy can certainly burn others as she is hot, passionate, and restless. On the other hand, a Queen of Wands can be gentle; she loves children and is an enthusiastic participant in their lives: making costumes for plays, coaching teams, etc. Which is good, but the querent should be warned that this woman might be in danger of being a soccer mom-too involved with her children's lives. 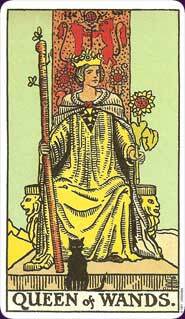 A Queen of Wands is a very creative woman with boundless energy to make, do, travel, entertain. The problem, of course, is that this queen has trouble keeping out of the spotlight. She can overwhelm or intimidate, be bossy and overbearing. At her best, however, she is an inspiration to family and friends, and often to admiring strangers as well. No matter the situation, this woman will get things done and done well. Learn the Queen of Wands tarot card meaning and the rest of the card meanings, symbols and stories in our eBook.